Experience the best of Australia’s western coast on this guided excursion. 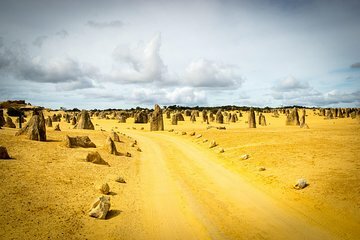 With pickup and drop-off in central Perth included, meet Australia’s native species at Caversham Wildlife Park and explore the Pinnacles Desert—home to the Nambung National Park. Discover ancient limestone formations in the wilderness, with time to soak up the sunshine by the beach before a delicious BBQ lunch, and try sandboarding on the mighty Lancelin sand dunes.